1 Measure 60 cm (24in) of 2 mm (0.078in) tinned copper wire but do not cut off. Mark the point and wrap this section of wire three times around a rolling pin. Remove from the rolling pin d grip the middle of the final loop between your thumb and forefinger. Wrap the loop around your thumb and pull it down. The second loop should now be reduced in diameter. These three loops form the egg holder. Refine the shape by moulding it around a large egg. 2 Bend the remaining end of wire up the outside of the egg holder to meet the wire still attached to the spool. 3 Bend both wires away from the egg holder to make the branch. 4 Bind the two branch wires together using 8 cm (3in) of 1 mm (0.039in) wire. Bend the wires down at a right angle. Leave an allowance of 2 cm (¾in), then cut off the end of the wire. 5 To finish off the egg holder, measure 60 cm (24in), then cut off the wire from the spool. 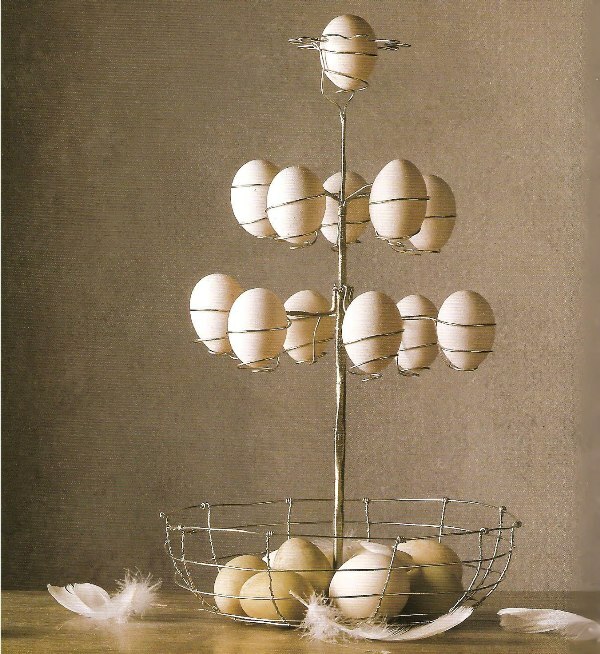 Make ten more egg holders in this way. The bound section of the six lower holders measures 8 cm (3in), and the section for the five upper holders measures 4 cm (1 ½in). 6 Measure 5 cm (2 ½in) of 2 mm (0.078in) wire and mark the point. Wrap the next section ten times around a pencil to form petals. Bend the petals round to form a flower. Use the first 5 cm (2 ½in) of wire to join the flower together and cut off. Bend the remaining wire down from the flower at a right angle to make the stem. Cut off at 75 cm (30in). 7 Form the top egg holder as described in step one but this time wrap the first loop around your thumb and pull down. Measure 70 cm (27 ½in) and cut off the wire from the spool. 8 Bind the end of the top egg holder on to the flower opposite the join. To hold the wires in place while you are working, bind them together with tacking wire. Bend the long wire extending from the flower to curve down the outside of the spiral. Using 1 mm (0.039in) wire, start binding the two stem wires tightly together. Bind for 7 cm (2 ¾in). 9 Bunch the stem wires of the upper five egg holders around the two stem wires to form the trunk. Wrap with a piece of strong tape to keep them in place. Using 1 mm (0.039in) wire, start binding the trunk from just below the point where the egg holders join the stem. 10 Bind the trunk for 7 cm (2 ¾in). Then bind on the six lower egg holders in the same way. Bind the trunk for about 25 cm (10in) below this second tier. 11 To make the basket, cut six lengths of 2 mm (0.078in) wire measuring 90 cm (36in), 89 cm (35 ½in), 88 cm (35in), 75 cm (30in), 65 cm (26in) and 46 cm (18in). Bend hooks at the ends of the wires and close up to make six rings. Squeeze the hooks tightly closed. 12 Splay out the wires from the base of the egg tree and curve upwards to form the side struts of the basket. Check that the diameter at the top is the same as that of the largest ring. 13 Tack (baste) the rings on to the struts, starting with the smallest at the bottom and working up to the largest at the top. Allow 2.5 cm (1in) between each ring. Attach the largest ring by wrapping the ends of the strut wires around it. The basket should be about 9 cm (3 ½in) in height. Bind the rings onto the struts.